The Center for American Progress wrote a post today advocating for a job guarantee. As with similar posts written by others sympathetic to the idea, the CAP proposal was muddled and failed to offer any plausible jobs that could actually be offered in a JG program. There will also be publicly-funded training to help people get private sector jobs. The program would target a certain employment rate, meaning that it would hire until the employment rate is hit. 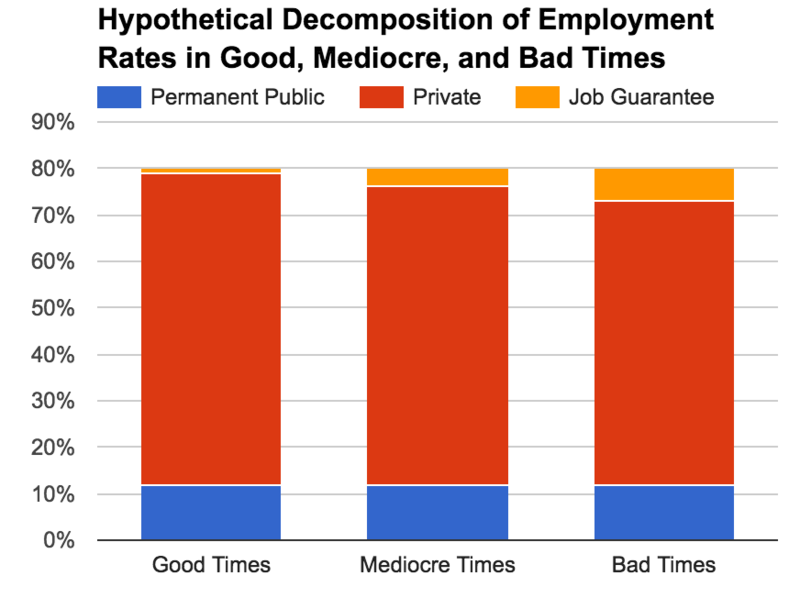 In the graph, blue represents permanent public sector jobs. This refers to things like teachers, health inspectors, police, and other similar jobs. The defining feature of these jobs is that they are permanent, meaning that they will always be filled by someone. These jobs will not come and go based on the condition of the private sector. They will always exist and always crowd out the private sector. The red represents the private sector. As you can see, when the red starts to shrink, the orange expands. That represents the job guarantee filling the gaps left by the flagging private sector and keeping the employment rate steady at 80 percent. The key to the JG is finding jobs that are nice to have, but are not strictly necessary. You need jobs that can go unfilled when the private sector picks up. Yet, here are all the jobs mentioned by CAP in its JG section: 1) home care workers for elderly people, 2) home care workers for disabled people, 3) child care workers, 4) teachers’ aides, 5) emergency medical technicians. Do these seem like jobs that can go unfilled when the private sector picks up? Should child care and assistance for the disabled disappear when the economy is booming? No. These are blue jobs not orange jobs. They should exist on a permanent basis, not as a temporary home for dislocated workers. This might seem like a nitpick, but it is not. Time and time again, popular advocates of the JG (not referring to the actual academics behind it) make this exact same mistake. They talk about how the JG would be a great way to wipe out unemployment and then they turn around and advocate for jobs that are not appropriate for a job guarantee program. CAP is right that we desperately need more public care workers, but that is precisely why those jobs would not work for a JG program. Conceptually, the entire discussion around job guarantee would become so much clearer if people were made to distinguish between 1) ideas they have for permanently expanding the size of the public sector workforce, and 2) ideas they have for flexibly absorbing workers when the private sector workforce contracts. Right now, (1) and (2) are crammed together, creating a muddled debate that is mostly incoherent. What do you think about H.R. 1000, the Jobs for All Act? I don’t know much about think tanks, but after what you were talking about on Chapo it seems weird that a think tank would put out such a muddled plan? Is that par for the course, or is CAP just bad, or is this not “real” think tank work just some blog post they made. Is that par for the course, or is CAP just bad, or is this not “real” think tank work just some blog post they made. Yes. Yes. CAP is a “think tank” though a lot of their thinking is based on placating big money donors. This is more muddled than usual for CAP. It has 9 authors on it. That’s never a good sign. Labor-intensive land beautification/environmental clean-up is a strong possibility, and one that Tcherneva has mentioned before. It doesn’t have a strict time scale, and people could move in and out of the work depending on private sector opportunities. Workers going on the Guarantee could also be “clumped” into various light infrastructure projects that only last a few months or so at a time, starting at intervals. Or you could have the government act as a civic and outright venture capitalist, and start/finance worker-owned cooperatives to do various non-profit and for-profit stuff. Most of the latter would fail (as most businesses do), but then they’d either come back and try again or move back into the private sector. I kind of think they don’t believe the actual number of workers on the Guarantee would ever get that large, because you’d never have a sudden large mass of unemployed workers under the system. The initial lay-offs would lead to people working in the Guarantee jobs, and push back against any downturn. Never is a long time; it’s possible to have a big real economic shock that produces a lot of unemployment. But I agree that in normal times a country with a functioning job guarantee probably doesn’t employ that many people in the labor buffer. Picking up trash is always something that can be done, as is basic maintenance of public spaces. There are plenty of run-down areas of the US where things could use a new coat of paint, etc. Things that currently aren’t being done at all, and that probably need to be done less if the economy is at full employment. . This is separate from the question of what the government should actually be doing as a policy matter. We definitely should spend more on eldercare and caring for the sick but we should do this in the normal way and not through a JG. The JG is intended to employ unemployed people but not lure people away from regular private or public sector jobs. People don’t want to cause artificial labor shortages in those regular fields. Some folks also don’t want to create wage inflation. For those reason JG proponents often suggest a low wage, often minimum wage, and a cap on hours. JG would still compete with the very low-paid and unpleasant jobs unless JG paid very badly indeed, but that’s not a big deal because there is really never a shortage of unskilled workers. Some people see it as a feature that a JG could push up wages for the most unpleasant and lowest-paid jobs, others see it as a problem. I lean more toward feature. The key thing is that JG doesn’t compete with skilled jobs with half-decent pay. You don’t want all the electricians quitting to go sweep the streets. Like Brett says above (and people say pretty frequently), land beautification and environmental work are good candidates. Land beautification could include installing sidewalks where they’re missing, repairing old sidewalks, changing the landscaping at public buildings, repainting buildings, stuff like that. Environmental work could include picking up litter, weeding out invasive species, planting native plants, and cleaning up abandoned lots and converting them to natural space. You could also work on trails; most trails are pretty spartan, so you could absorb a ton of labor by making hiking trails super nice and well-trimmed, with nice signs and steps and bridges and you name it–just try not to wipe out the nature in the process! Most of this is unskilled work that normally doesn’t get done or barely gets done. A lot of the beautification stuff has a skilled component but that’s okay. Normally in a recession the construction industry is very hard hit, so there will be plenty of skilled masons and painter and carpenters. And even if they require skilled workers all the items I listed also make use of a lot of low-skill laborers (in practice laborers are actually often pretty experienced but you can afford to have some inexperienced folks around). Another item people mention a lot is replacing old sewer and water pipes. Utilities have a lot of leeway in how long they wait to replace pipes. Generally they wait way too long. So when a recession hits it’s pretty much a sure thing that there will be a lot of pipes sitting in the ground that could use replacing. You do need skilled, specialized folks for this work, but you can spread your experts thinner than usual and fill in the ranks with laid off construction workers and other folks. Then sometimes people talk about repairing roads and bridges. Bridges take a lot of engineering and planning so I don’t see that working out. Roads are a possibility in rural areas but in cities those also take a lot of engineering and planning. Previous Previous post: Would Ending the Mortgage Interest Deduction Reduce the Racial Wealth Gap?